The lazy cook in me was intrigued by the baked pasta recipe that appeared on Smitten Kitchen today. Because the pasta it used was orzo and (why did I never think of this before?) the orzo can be baked without pre-boiling, thereby saving you six minutes and the washing of an extra pot. You’re welcome. Deb’s recipe, adapted from our favorite Yotam Ottolenghi, is for a cheesy (just-cheesy-enough, she says) bake with the usual Ottolenghian flourishes of lemon zest and oregano. And it sounds lovely. But once I started browning perfect summer vegetables–eggplant, zucchini, peppers, falling-apart fragrant tomatoes–I couldn’t bear to adulterate them much. (If your tomatoes are less than perfect, by all means try out the original recipe’s suggestion to jazz them up with a few tablespoons of chopped oregano and the zest of a lemon; you could even add that chopped mozzarella.) For me, whole wheat orzo, salt, and the heat of the oven were enough to make the pan of vegetables a hearty late-summer meal. 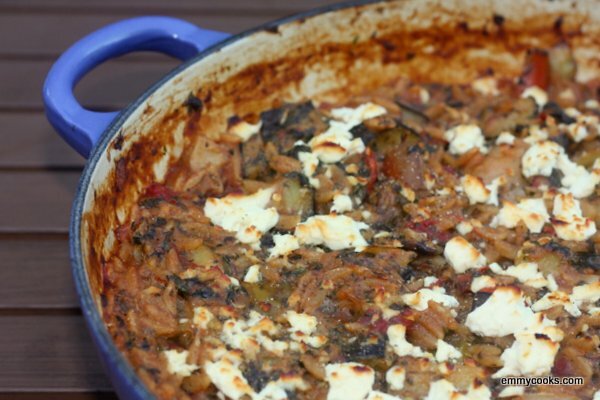 I crumbled feta on top at the end and browned it under the broiler, but it’s perfectly delicious without the cheese. A tomato salad on the side provided a sweet little bite of acid to compliment the richness of the cooked vegetables. (The Indigo Rose tomatoes were almost too pretty to eat. Almost.) Baked Whole Wheat Orzo with Late-Summer Vegetables: Dice a small eggplant or two (about half a pound) into 3/4″ cubes and begin to brown in olive oil over medium-high heat in a wide, oven-safe pan (preferably one that has an oven-safe lid). Chop a pound of zucchini to a similar size and add to the pan. Chop a red pepper or two and add to the pan. Cook until the vegetables are soft and browned, then add two large diced tomatoes, lower the heat, and allow them to disintegrate into a sauce. Season to taste with salt. Stir in 12 oz. whole wheat orzo, 2 c. water, and 1 tsp. salt. Cover pan with lid or foil and transfer to a 350 degree oven for 20 minutes. 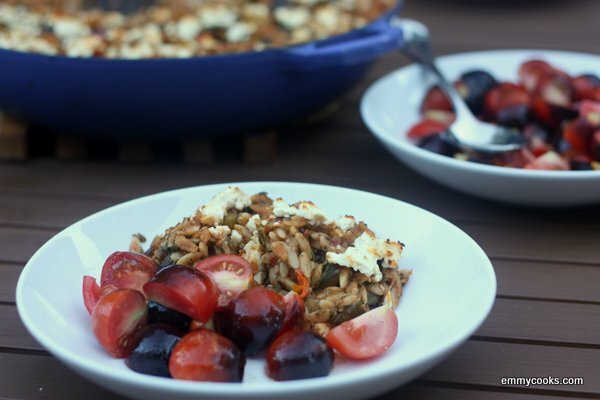 Remove from oven, stir well, crumble a handful of feta cheese on top, and taste a piece of orzo. Return to the oven for a few more minutes if necessary. When the orzo is nearly tender, turn on the broiler to brown the cheese and crisp up the edges. Make a tomato salad dressed with olive oil, salt, and pepper, and mound the tomatoes atop the orzo or serve them alongside. Put a pepper mill on the table so everyone can shower their pasta in freshly ground pepper. This entry was posted in Food, Noodles, Recipes, Vegan or Would-Be-Just-As-Good-Vegan and tagged baked pasta, eggplant, orzo, peppers, summer CSA recipes, tomatoes, whole grains, whole wheat pasta, zucchini on September 6, 2012 by emmycooks. Delicious! This is a sort-of vegetarian version of the lamb with orzo recipe I did recently and that was divine. Isn’t orzo such an amazing ingredient? The other funny thing about them is that the dark purple pigment in their skin makes them almost blueberry-like in their behavior when you cook them– I made an heirloom tomato tart with large red tomato slices baked over a layer of goat cheese, but then I nestled a few of the Indigo Rose tomatoes in to fill the spaces, and the areas of goat cheese under them turned BRIGHT purple! Looks terrific! When tomatoes are really good, I hate to fuss with it too much either. This makes my mouth water! Probably because you haven’t eaten in two months! I hope you’re having fun getting back to post-dissertation life, Dr. Daisy! Great recipe! And some pretty stunning tomatoes too! What more would a meal want for? Looks fantastic. Never occurred to me to bake it either. What a stellar idea. Cooking the pasta in the sauce gave it a lot more flavor than just tossing cooked pasta with the veggies. I’ll be doing that again! Another delicious recipe. Come and link up to this week’s CSA Link party when you get a chance…http://inherchucks.com/2012/09/06/whats-in-the-box-42-a-giveaway/. Looking forward to seeing you there. ps: LOVE orzo…but have never seen whole wheat…must find! I think there are a lot of new (better) whole wheat pasta options now compared to a few years ago. I often like it more than regular pasta, especially with strong-flavored vegetables or cheeses. I always love seeing the photos of your CSA boxes, they look great! Thanks Emmy :) Love having you at the party! I love this! I’ve never thought of baking orzo either, but I won’t be able to resist now! Aren’t they pretty? I love this CSA because they grow tons of unusual varieties of fruit and vegetables. The many different kinds of apples are stunning in fall–they taste like nothing I’ve ever tried before. It’s so lucky to have access to such great produce!